If we can introduce a new Constitution through the present Parliament, it would be a remarkable political achievement for the country. 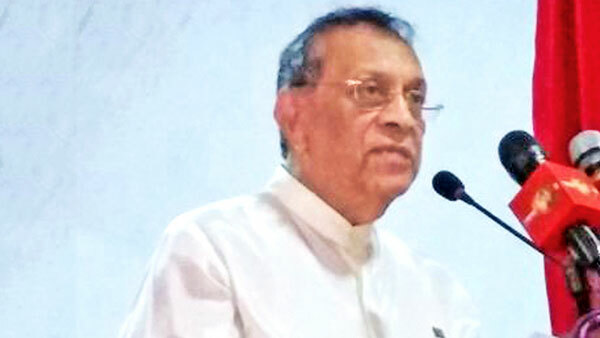 If we fail in that endeavour and pass it over to the next generation, it would be a great sin, Speaker Karu Jayasuriya said. “Hence, I would like to make an entreaty to all political leaders of the country to honestly contribute towards rectifying this national crisis ethically,” he said. He was speaking at the Founder’s Day Commemoration of the Sri Lanka Ramanna Nikaya at Weliwatte Wijayananda Maha Priven Vihara in Galle on Monday under the auspices of Ven. Agga Maha Panditha Napane Pemasiri Thera, Mahanayake Thera of the Sri Lanka Ramanna Maha Nikaya. Speaker Jayasuriya is the Chairman of Nikayarakshaka Sabha of the Ramanna Nikaya. At present, even the members of Buddhist Maha Sangha are also divided over the introduction of a new Constitution to the country and express diverse ideas about the process. The division is painful for the country. Some elements overseas are taking improper advantage of these contradictory pronouncements of the Maha Sangha. It is the obligation of the present generation to solve this national problem without passing it over to the next generation, the Speaker said. The Sri Lanka Ramanna Nikaya is one of the three main Buddhist Orders of the country. Sir Henry Olcott also embraced Buddhism at the Wijayananda Maha Vihara and it was at this remarkable temple that the first Buddhist Dhamma school was inaugurated. Hence Wijayananada temple holds a prominent status in the Ramanna Nikaya, he said. “There would be no impediment to a new Constitution if we can get the broad endorsement of Maha Sangha. Then we can submit it to the President,” the Speaker said. “As Chairman of the Constitutional Assembly, I wish to state that there is no of draft Constitution at present. There is only a set of proposals for a Constitution. Once we obtain the blessing of Maha Sangha, we can go ahead with the constitutional process and with the agreement of all sections, we can introduce a new Constitution acceptable to all communities,” he said.